The success of any conference relies heavily on good planning. As a host, it’s important that your guests are well prepared on the topics that will be discussed and other pertinent information that will add to the success of the meeting. Nortel Networks achieved this objective by having us create their Road Show Kit. e design was thrilled to create materials for Nortel’s conference in Miami, FL. The “Road Show-In-A-Box” project included the design of a 3D box that housed two cd sleeves and labels for a DVD. 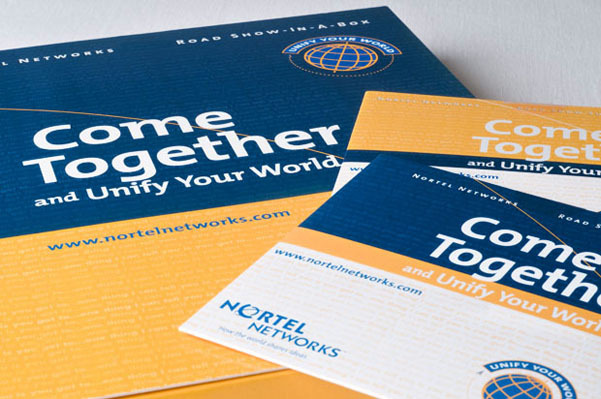 Nortel was so please with our work on the Road Show kit that they asked us to do additional work for the conference, including a printed schedule, banners and signage that was displayed in highly visible locations around the hotel.